Today we're announcing a usability update for the Position Tracking tool: the first campaign status update email notification. As you know, collecting initial Position Tracking data can take some time, so now, whenever you start a new Position Tracking campaign, you will receive an email notification the very moment SEMrush has finished gathering data for your new campaign! 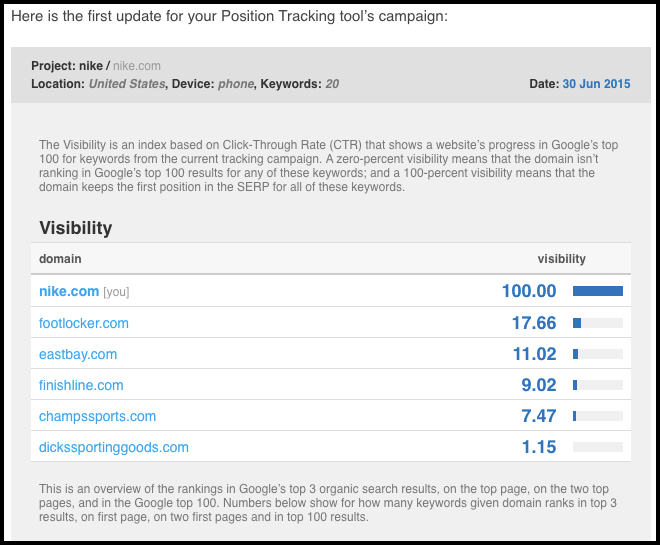 This email will also provide you with an easy-to-read summary of your campaign, including online visibility ratings and keyword rankings for your and your competitors' domains. This information will be displayed as a convenient list with automatically generated links, showing your main domain first followed by the domains of your previously selected competitors. You can either click on your domain’s name to get a report for your domain exclusively, or click on any of your listed competitors to view a report comparing your domain’s stats to theirs.